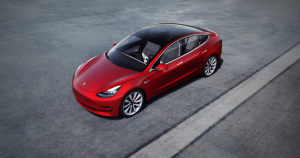 After many delays, Tesla is officially reducing its popular Model 3 electric luxury sedan to a base price of $35,000 — a long-routed price point for CEO Elon Musk. Tesla made the announcement via an email sent out to its retail stores today, Electrek reports. A $35,000 Model 3 featuring a standard interior with a 220-mile-range battery, 130 mph top speed and under second 0-60 acceleration. This option will exclude buyers from leather and power seats according to Electrek — you’ll have to shell out extra for a higher trim for a “full” premium interior. A brand new “Partial Premium Interior” with higher quality seats will set you back an additional $2,500. And a Standard Range Plus option brings the range up to 240 miles with a top speed of 140 mph. Musk previously stated that the Model 3 would start at roughly that price in a Feb. 6 tweet — but only once you factor in thousands of dollars in tax credits and fuel savings. Tesla CEO Elon Musk teased the announcement on Wednesday promising “some Tesla news,” which launched the media into a tailspin as it tried to figure out what Tesla was about to announce. All-things-Tesla site Teslarati speculated the announcement was going to be about the Model Y, Tesla’s long-promised SUV. Elon Musk promised back in May of last year that the Model Y was going to be announced on March 15 of this year, just over two weeks from now. The news comes after an ill-advised tweet landed Musk in hot water with the Securities and Exchange Commission earlier this week.